K.J. Simmill is an award winning British author with books released in both the fantasy and non-fiction genres. When she is not writing, she is an avid reader and a passionate gamer. Each of K.J's books donate at least 10% of the author royalties to The DMWS who are an independent charity who operate across the UK, and overseas, supporting those who put themselves in harm’s way to serve our country. This includes Armed Forces personnel, Reservists, Veterans and their families, the Police, and increasingly other front line services as well as to their primary care givers and healthcare professionals. Remedy is the third book in The Forgotten Legacies Series by K.J. Simmill, an epic tale that plunges the reader into a world of magic with hints of mythology. This is a story that follows the quest of an adventurer into the sealed and forgotten realm, into The Depths of Acheron. But he can’t get what he wants from this world without giving to the banished what they claim to be rightfully theirs. The reader is introduced to a cast of powerful characters, a world on the brink of perdition, and one who wants to manipulate the powers that be to make the future his own. I loved the level of conflict in this novel and its originality. The author creates worlds that are in conflict with each other and concepts that will excite the minds of readers. As one reads on, there is that tingling feeling that something huge could happen at any moment, and a lot of things do happen, dramatic and breathtaking. The conflict is monumental and it drives the plot, making it move forward from unexpected angles. It takes a lot of skill to write about an imaginary setting and make it feel like some place readers are familiar with, and K.J. Simmill seems to have this skill. The writing is beautiful, punctuated by compelling dialogues, streams of consciousness that explore the internal conflict in characters, and vivid descriptions of the setting, scenes, and characters. Remedy is an entertaining story with a spell that will continue to haunt readers after they are done reading. 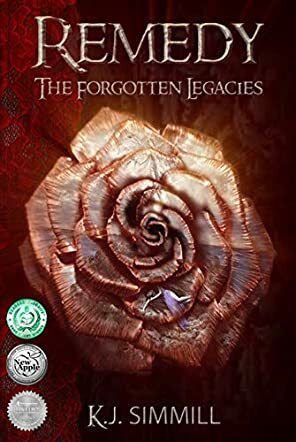 Third in The Forgotten Legacies series, Remedy by K.J. Simmill is a fine blend of magic, legend, and adventure. Like the other two books in the series, this book stands on its own and is an epic fantasy tale. Readers are introduced to Rob in the opening scene, who finds himself being driven into the twisting labyrinth where he feels that his chances of survival are nil. From The Depths of Acheron to Elpida to Méros-Génos to the Research Plexus, The Stepping Realm, Darrienia, and many other fantastical characters and places, the story is compelling and will keep readers glued till the very end. The plot has many layers to it and the portrayal of the characters is strong, which makes them memorable. There is an element of spirituality and mysticism that runs through the entire story. Readers find themselves thrown into a maze of intrigue, adventure, fantasy, whimsy, and magic as the story progresses. The narration is rich and detailed and K.J. Simmill gives importance to intricacies pertaining to characters, scenes, and places, making it a visual delight for readers. The author manages to keep the tempo and pace of the book till the very end and there is magic in her words as she weaves them into legendary places, interesting characters, and mysterious situations. There is a sense of urgency and tension in the story, yet at the same time the element of hope gives another dimension to the plot. For all those readers who love fantasy and adventure stories, this book is a must-read. Remedy by KJ Simmill is Book 3 of The Forgotten Legacies Series. The adventurer walks alone, following the whispers he hears, whispers that come from an ancient realm. Those whispers put everything at risk and the adventurer must enter The Depths of Acheron, a sealed place where the banished are sent, to search for something. The banished won’t let him go without taking something in return, something that is theirs already. There is one who will do everything in his power, will use everything he must to ensure the future, but to do that, he must change everything. The banished will return and the hidden will be shown for only then can he reign; only then can the prophecies come to pass. Remedy (The Forgotten Legacies Series Book 3) by KJ Simmill is a gripping story, packed with action, with adventure and fantasy. The story is unique, it flows smoothly, and is very easy to follow. Although it is part of a series, the author advises that it can be read as a standalone. I found that there was sufficient information to make it so, although I feel that you should perhaps read the books in order to gain a true feel for the stories. The characters are developed perfectly and can easily be related to. The author has a clear way with words, a magical way of writing, filled with colorful descriptions that bring the story to life before your eyes. I am very tempted to read the first two books now and would highly recommend this book to anyone who enjoys a fantastical, magical adventure. Remedy by K.J. Simmill is the third book in the Forgotten Legacies series. I haven’t read the first two books yet, but if they are as detailed and full of interesting characters as this one, then the series is a massive undertaking. The tone, the mood, and even the writing reminds me of George R.R. Martin’s Game of Thrones, but with not as much emphasis on politics. Remedy stands by itself as a great novel, but I personally want to read the first two books and get the complete picture. It is a complex world with a lot of dark magic going on. Remedy is not a light read, but there are some of us who want to lose ourselves in an epic tale with complicated characters. This book is for us. I am sure that in time Remedy and the Forgotten Legacies series will become a must-read for fans of epic fantasy. I loved Rob, the protagonist in Remedy. I loved that he is a competent hunter who has his own moral code which he feels compelled to follow, regardless of what those around him are doing. I liked that his moral code is steeped in a sense of fairness rather than just might. I liked that he is likable, but always careful; that he is smart but compassionate. The tone of Remedy is dark, but K.J. Simmill skillfully weaves a sense of hope into the story. Not everyone is crazy for power or wealth. Not everyone is living in despair. Love exists in this world, but it is under siege. The plot is complicated. This universe is complex, but well explained. I enjoyed the writing. Remedy is a novel you can lose yourself in. Remedy is the third book in The Forgotten Legacies series by K.J. Simmill and it is one that has great appeal for fans of epic fantasy and adventure. Although it’s part of a series, this novel reads well as a standalone story, dark and spellbinding. This book pulls the reader into a dark and mysterious world with a prophecy involving the rebirth of death, rumors of an ancient power that could destroy the world and the peace it has hitherto known, and adventures into a dangerous and powerful world, the Depths of Acheron. In this setting, one man sets out to challenge fate and alter the future by stepping into the realm of the sealed. Can there be any remedy when hell breaks loose? K.J. Simmill has crafted a spellbinding story that will transport readers into a magical and complex world to navigate. Readers will love the hero and the villains of this tale, but what I found the most fascinating is the concept behind it, the idea of the past visiting the present, the sealed mysteries, and the rebirth of death. The writing is great and the plot is well-imagined and written with a masterly touch. Remedy features powerful descriptions that conjure images to flood the reader’s mind. The story reads as though crafted with a binding spell and readers find themselves following the characters and keeping pace with the conflict, anxious to find out how it ends. This is a delightful read for fans of the genre and readers looking for great stories with strong plot lines and entertainment potential.